With most schools back this week, we thought tips that helped create peaceful mornings were rather timely. "Our school morning routine was extremely busy with my daughter often in tears and stress culminating just before we walked out the door. It had been concerning me for a while, but then, not one but two new ideas came about that changed my mornings forever. The first change was in the order of things. Instead of getting myself ready first, I had my daughter ready with hair done, uniform on with shoes and socks BEFORE I went in the shower and got myself ready. So simple, right? But, the difference it made was incredible. No stress, no tears, and no raising my voice to coerce my daughter to finish getting dressed before we left for school. Secondly, I realized there were just three main things to focus on in the morning - make breakfast, pack the lunches and get dressed for the day ahead. I began to focus on each one separately, with minimal crossover in-between. First, I fed my daughter, then myself, then the pets. Second, I prepared our lunches for the day with no distractions. If my daughter made a request, she came to me, not the other way around. This was a lovely side effect of being so focused. I was calling the shots! Third, I helped my daughter get dressed, with minimal fuss. We tied back her hair and put on her shoes. Then, it was my turn to shower and prepare myself for work. And what did I find? There was time left over! No having to look at the clock every few minutes, just at the end of each main task. I checked the time a little at first, but once I knew that being focused made the task quicker, I realized that everything would indeed be completed. Solution found and morning peace returned." 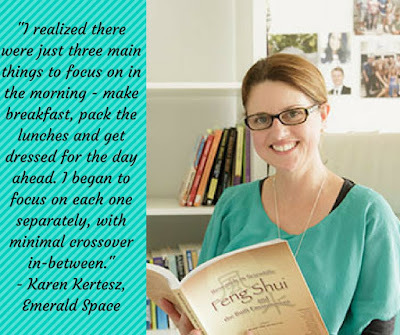 Karen is a certified feng shui consultant. "A flowing space in clutter's place". Learn more about Karen and her practice at www.emeraldspace.com.au.